There's a lot in our journals this year! Several years ago, my children and I began keeping a “Gratitude Journal.” Most evenings we write down the things and people and moments from our day for which we give thanks. As I enter my eighteenth month as the executive director of the Presbyterian Church (U.S.A.)’s national archives, I’m taking a moment to note some of the many reasons I am grateful for PHS. 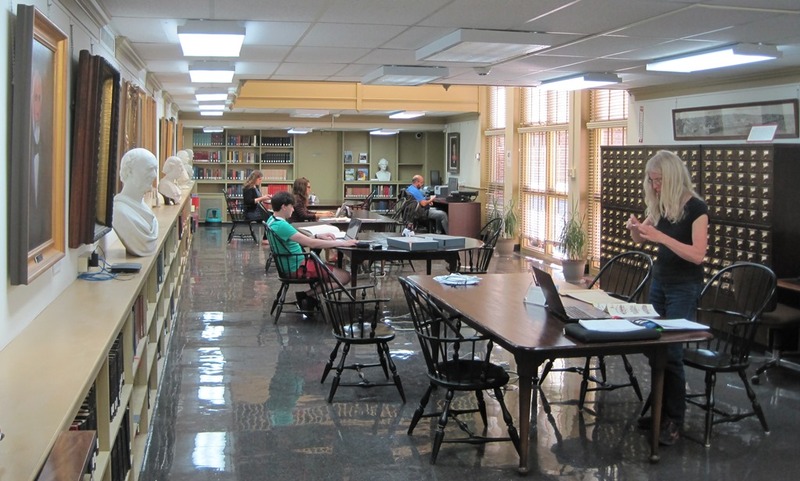 PHS Reading Room, September 2016. I am grateful for the unique ecumenical and international nature of our holdings. We have such treasures as the records of the National Council of Churches in Christ and its predecessor, the Federal Council of Churches, as well as tens of thousands of images of faith in practice taken by the Religious News Service over the course of the twentieth century. We have two hundred years of global missionary records that tell of the creation of schools, hospitals, and changed lives. PHS has collections that draw high-caliber scholars and researchers from around the world; some of these collections first brought me to PHS as a doctoral candidate. I am humbled and grateful for the hundreds of individuals who come to PHS each year to dive into our archives for their own research, not to mention the thousands who visit our website monthly for information and insight. Our Research Fellowship program facilitates important scholarly work and future publications that document the imprint Presbyterians have made in the world. The Heritage Preservation Grant program helps our denomination’s smaller historic congregations ensure that their history will be available for future generations. I lift up a prayer of thanks for each of our donors who generously make those fellowships and grants possible. A few statistics showing the kind of help PHS has provided in 2016, January 1 to October 15. I am grateful, too, for the hardworking and creative staff at PHS. If you have visited our building, emailed us, or spoken on the phone with a staff member, you know the pride and commitment each team member has for PHS and its mission. As we prepare to celebrate our building’s 50th birthday in 2017, our aging floors shine as brightly as ever, boxes of newly acquired records are carefully arranged in our block-long archives annex, and the board and staff are dedicating themselves to the successful implementation of our new strategic plan, which calls for increased outreach and additional partnerships with Presbyterians and congregations. I delight in every email I receive from someone who has had a helpful interaction with PHS. Every day, our staff is helping researchers explore primary resources, genealogists track down family members, congregations digitize vital historic documents and celebrate important milestones, midcouncils and national agencies manage their records, and all of us connect with our forebears as we seek to faithfully witness in the present. For all of that, I am supremely grateful. Perhaps most humbling for me are those moments when we are able to locate the records of family members. 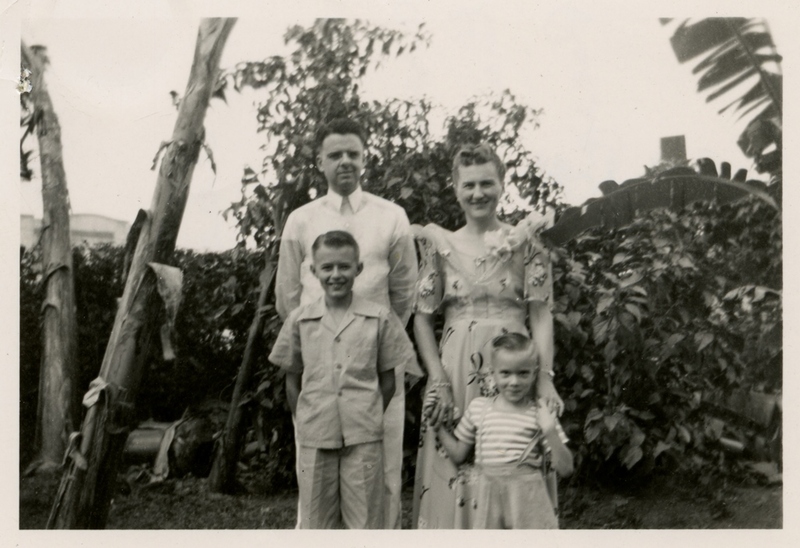 I remember how moving it was to access my paternal grandparents’ records from their nearly 25 years as mission workers in the Philippines: to read their correspondence with sponsoring congregations back home, look at their missionary applications, view photos of my father as a small boy. The emotions are equally strong for me when PHS is able to hand someone their aunt’s or great-great grandfather’s personnel or missionary file, or show them the line in a church register that notes their great-grandmother’s baptism, or share the photo of a pastor who sat by their father’s bed and prayed with him in the final days of his terminal illness. How grateful I am for those moments when I know that PHS is giving back for the many, many gifts each of these earlier disciples gave to all of us. Eugene Andrew Hessel, Elizabeth Wonder Hessel, and children. Philippines, 1948. Image: RG 360. All of this—our ability to collect, preserve, and share such a rich and diverse collection of records with researchers from our backyard and around the world; our beautiful building and talented staff; our weekly interactions with guests who enrich our lives—is possible because of our many friends like you who support our work. I am grateful for each of you, and for the gifts of annual support so many of you make this time of year. Your additional gifts of time and historical items, your willingness to share PHS stories and blogs and work with others, your prayers, your words of support to me and the rest of the staff in Philadelphia or on the road: all of this support is precious and all of it makes PHS tick. I have a dream that we make the Presbyterian Historical Society known around the world as the preeminent research center for Presbyterian and Reformed history in the United States—both for online and in-person visitors. I also dream that we partner in creative and helpful ways with other institutions to nurture our churches and communities. We are starting to make those dreams a reality—thanks to your help, financial support, and belief in what we are doing. I am grateful for you, our PHS friends. The Grace and Peace of our Lord be with you in this season of hope and change. Curious about ways to support PHS while getting benefits? Check out our membership and commemorative brick paver programs.